Sitting down for pretend play tea with a toy tea set is a great way for children to learn their table manners and play socially with others. This tea set is still in its original condition from when it was probably purchased in circa 1970, and in its original pretty box. The jewellery is still in its original bags - never opened, and the cutlery is still attached to its plastic - never pulled off. This pretty set allows a little girl to get all dressed up for tea. We have done our research and have found that this lovely little childs/dolls pretend play teaset is called "Little Lady Tea Set"
It has the markings of Xellon on the bottom. It is made of light egg shell blue with pretty white flowers around the top of each item. 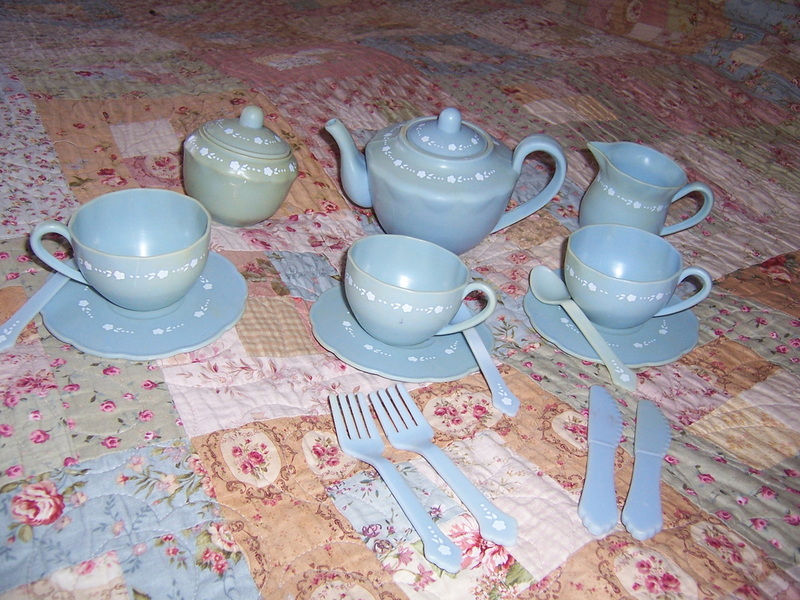 This teaset is not complete, but is wonderful to think it still exists as it is approx 50/60 years old. It does not have its original box. It is very pretty and has the look of an antique Wedgwood design. This is a real find for Pedigree doll collectors. We have managed to find a toy Picnic set in a cardboard suitcase which is marked Pedigree. It is amazing that this is in such good condition. It must be over 60 years old. The suitcase is 41cm x21cm x7cm. It is a brown/white type of colour and has 2 metal clasps/ locks at the front and a metal handle. The locks and handle has a tiny bit of rust on them. Inside the picnic case lid is the name "Pedigree" in gold lettering on a strip of matching coloured cardboard. This strip holds the serviettes in place, and another cardboard strip holds the cutlery in place. It is a complete set except for the missing stopper. You can just imagine back in 1950 a little girl sitting down with her dolls and teddies and having a picnic with them. This porcelain pretend children's tea set is an excellent condition and appears to have never been used and is a complete set. We are not sure where or who has made it as there are no markings on the box or the tea set pieces. It is white in colour with a gold type rim around the teapot, saucers and teapot lid. There are pictures on the teapot, milk jug and cups. It is in its original box which is still in good condition, and has its original blue cardboard inserts to hold the pieces in place.